Seat your guests in elegance and comfort with these resin wicker outdoor chairs by International Caravan Home Furnishings. Their sturdy construction endures weather conditions of all seasons and is both rust and heat resistant. I really like these chairs and the price was very good. 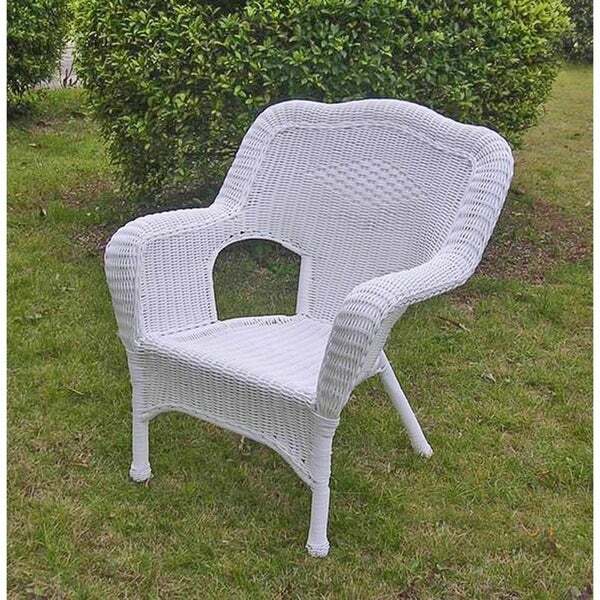 I have another set of outdoor wicker and could not get another set of the chairs I purchased previously at this price. I actually like the look of these better than what I have. They do look darker than the picture I went by when ordering, but that is not a problem, they will blend fine. They were also sent to a freight forward and shipped to the Caribbean and arrived in great shape. Excellent quality; very substantial and well built. Great value for the price. I'm planning to order more! A wonderful addition to our outdoor seating. Arrived promptly & in good condition. Very comfy. Just what we were looking for. comfortable seating, endured stormy weather, still here. GREAT CHAIRS, GREAT PRICE AND SHIPPED SO NICELY! I HAVE THESE ON MY FRONT PORCH AND THEY LOOK SO NICE. These are great for outdoor patio replaced more expensive set that did not hold up to elements these are doing great. 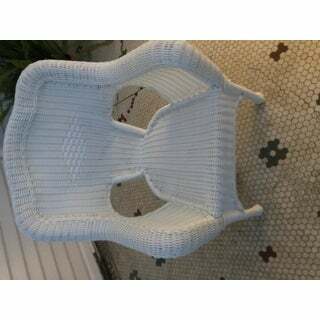 Searched high and low for old fashioned outdoor wicker white porch chairs. They are very hard to find at a reasonable price. These are perfect. Look great, right size, comfortable. These chairs arrived quickly and were packed securely. They are the perfect size for my outdoor elevated deck banking patio doors. However, I purchased the white, and although they are very comfortable and sturdy, they look plastic. The 'wicker weave' look is present, but they are shiny and not at all the matte finish I was looking for to replace my previous set., which was resin but did in fact look like real wicker. A little disappointed but not a deal breaker. I kept them, just not thrilled with the look. Chairs are nice quality. Unfortunately one chair has uneven legs meanjng this chair "rocks". The quick fix would be to put a thick piece of paoer folded or wood to make up for the inch of inequality. I had hoped customer service might help me with a solution, but they suggested I go to Lowes or a hardware store to try to find something I could use to fix uneven legs. That is a very unspecific and vague solution......go to a hardware store and ask them to help me. I wish I could gave veen provided with a legitimate and specific suggestion. Chair just rocks. ...I gave nig had time to spend looking for solution. Chairs are vety nice other than this issue. im am very happy with the resin wicker chairs . I am so very pleased with the wicker chairs.The table had a few imperfections,but I can live with it.Im looking forward tho getting the pillows for the chairs.I would recommend overstock .com for merchandise from overstock. wonderful addition to our front porch - plenty of width for larger folks to sit comfortably. Came very well wrapped and in perfect condition. Beautiful, and with some cushions, will coordinate with my other white wicker on the patio. Great, sturdy chairs! The man in the photo is 5,9 and average size man. The chairs have a high back for support, wide and deep seated for comfort. I’m every pleased with the purchase. They are just what I wanted. Good looking, comfortable to sit in...looks perfect in my guest bedroom with accent pillows. Would buy again. They are a great made chair...just what I wanted. They just fit where I wanted them for. They look so beautiful. Would recommend them to a friend. Very happy with this product.Happy with this product. I love the way it's white, not antique white. I purchased two of these for my screened-in porch. I added cushy pillows and it was perfect. It has held up well in the somewhat open environment. These chairs are beautiful! The price for TWO chairs is unbeatable. The color is exactly what I was hoping for. The size of them is perfect...very comfortable as well. Seem well made, and like they will last for years. "What size cushion would this chair require?" i have 18x18 these are the most sturdy and beautiful chairs! 19 x19 would work. I hope it helps. "There are 2 different style chairs shown here depending on the finish. Antique pecan or Mocha tan. Which is the true depiction of what this item is?" "Can these chairs be used as dining chairs for around a dining table? Was just wondering if they would be the right height." Carol, these chairs may be a bit low for dining chairs. I just measured my dining room ladderback chairs and they are about 2-3 inches higher than the porch chairs. 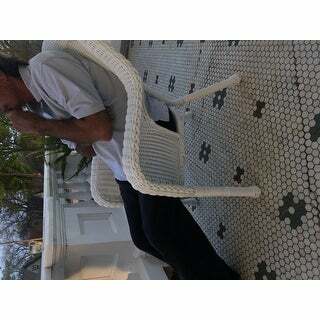 My porch chairs are about 15+ or so high and the dining chairs at least 18 at the seat. Hope this helps . "Is the white color selection of the chair a bright white or more of an off/antique white?" The "white" appears to be a bright white in my opinion. "Does the chair need a cushion or is it comfortable without?" Hello funrunner22, this can be used with our without a cushion, it is very comfortable without one. Thanks for shopping with us! Will any cushion fit on these or do I have to look for a certain size? "man seating on, how many pounds will it hold." Hello white wicker, we do not currently weight test items. We apologize for any inconvenience. Thank you for shopping with us. "What size seat cushions does this chair use? Does Overstock sell the right size for this chair? (Link if possible, thank you!)" Hello PamelaCEC, the seat dimensions are 19 inches x 17 inches deep. The 18 x 18 inch seat cushions should fit pretty well. We have included a link for our seat cushions. Thank you for shopping with us.